DUH! I know I’m stating the obvious here. But summer is so short here in New England that I have to shout it out with joy every day. I am still having nightmares of the winter we just had **Shudder**. As a matter of fact, I think I still have a patch of snow in the backyard. Ok, shake it off Lisa. Bring it back to summer. Beautiful, glorious, summer. Sorry, I couldn’t help myself! I just love that song. Oh Olaf, you make me smile. Jeez! I cannot focus today! Okay so, during the summer I do my standard groceries at the grocery store, but all my fruits and vegetables come from the many farm stands around. We try to eat a little lighter, a bit healthier, which is totally easy to do with all the farm fresh produce. Each week, it’s something different. Whatever is abundant is what I buy. Right now farmers are putting out their heirloom tomatoes, sweet crisp corn, cucumbers and of course zucchini. If you’ve ever planted zucchini, you know how much it produces. You graciously bring them to your coworkers or leave them in your front yard for passers-by to grab. Then you’re forced to make zucchini bread, muffins, cookies, cakes, brownies, cupcakes and so on. They can be sautéed, stuffed, battered, fried, baked and grilled. Good gravy the list just keeps going! The possibilities are endless. Yup, face it. You’re eating zucchini for breakfast, lunch and dinner. Deal. So you better have a few good recipes in your arsenal. 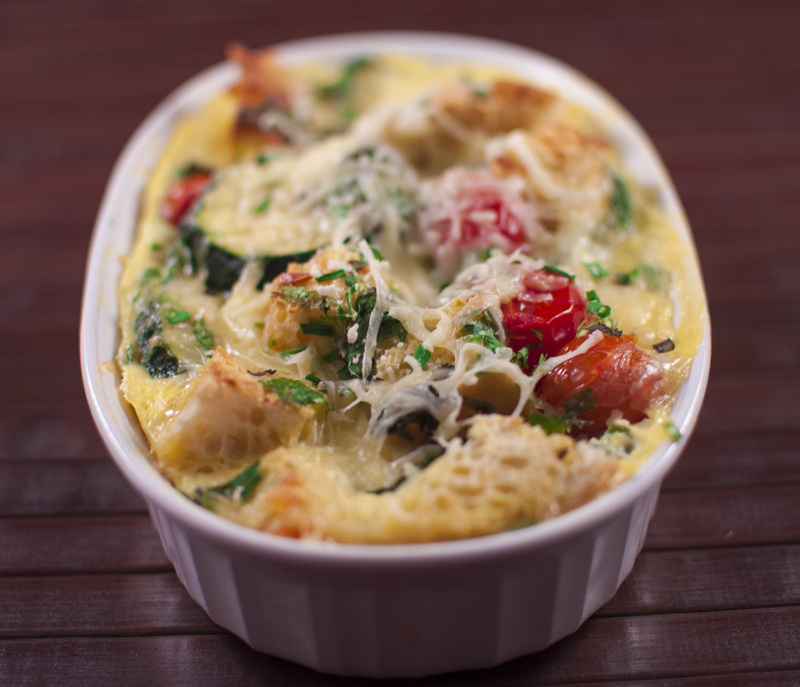 On my quest for yet another zucchini recipe, I came across this strata from Midwest Living. It looked so flavorful and satisfying as a summer meal, I was glad I had just hit the zucchini and cherry tomato lottery at the farm. Let’s not forget how super easy it is to put together. It is best made the night before and chilled overnight in the fridge then popped in the oven to bake the next day, making it great for a brunch item or quick breakfast. Zucchini and sweet cherry tomatoes are lightly in butter and garlic, layered with hearty French bread and Swiss cheese then soaked in a rich egg mixture seasoned with aromatic fresh chopped herbs. Heaven! I’ve never been to Italy, have you? If you have I’m totally jealous of you right now. I can imagine this would be a dish one would find there. Which puts Italy back on my bucket list of top places to visit. After Disney of course. DOI! Every place come after Disney. I completely enjoyed this dish and so did my guinea pigs *ahem* co-workers. I think the center was a bit runny, as zukes tend to hold a lot of water. But, making sure it is completely cooked through and golden should eliminate that problem. This is definitely a recipe to hold onto when zucchinis have taken over your life. In an extra-large skillet, melt butter over low heat. Add tomatoes and zucchini. After 3-4 minutes, add the garlic and cook for another 5-6 minutes. Don’t let garlic Stir occasionally, or until tomatoes begin to lose their firm round shape; remove from heat. Place half of the bread cubes in a greased 3-quart baking dish. Top with half of the vegetable mixture and half of the cheese. Repeat layers with remaining bread cubes, vegetable mixture and cheese. In a large bowl, whisk together eggs, milk, parsley, basil, chives, salt and pepper. Carefully pour egg mixture evenly over bread mixture in dish. Using the back of a spoon, gently press down on layers. Cover and chill at least 2 hours or up to 24 hours. Remove casserole from fridge. Preheat oven to 325 degrees . Bake for 50 to 65** minutes or until puffed, golden and set (160 degrees ). Let stand for 10 minutes before serving. *To dry bread cubes: Cut the bread into 1-inch cubes, using a serrated knife. Preheat the oven to 300 degrees F. Arrange cubes in a single layer on a baking pan. Bake for 10 to 15 minutes or until lightly browned, stirring once or twice. ** If chilled overnight, baking time will be longer than if only chilled 2 hours.